A few months ago we ran a blog about MGM’s 1960 disaster outing, The Last Voyage. The movie written, produced, directed and edited by the husband and wife team of Andrew and Virginia Stone, not only predates (1972’s) THE POSEIDON ADVENTURE, it was shot completely on a REAL ship, the ocean liner SS Ile de France. The ship was destined for the scrap yard after 30 years of cruising the Atlantic, and was leased out at $4,000 a day off the coast of Japan. 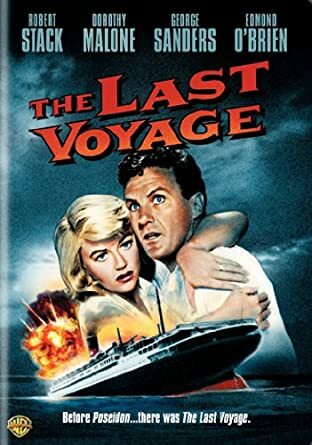 Dorothy Malone and Robert Stack are cast as vacationing parents of a young boy who find themselves literally staring down a deluge aboard their cruise liner. Various loud mishaps afflict their ship, and Malone finds herself trapped in a tiny stateroom as the water levels rise. She is underneath fallen debris, and is pinned — can’t move. It’s up to Stack and the boy to find vitally necessary help from a frazzled crew coping with multiple disasters in the thick of the chaos on the doomed ship. Will they make it in time? As big George Sanders fans, we were delighted to see this solid actor play the ship’s captain, at first obtusely stubborn then remorseful and sympathetic. Edmund O’Brien, another favorite, is aboard as the loud-voiced go-to operations guy who seems to be the lone person on board to grasp just how serious the situation is. Stack is excellent as the surprisingly athletic husband/father. But for our money the star of the show is Malone. She looks great, as usual, and plays the seemingly doomed mother with dignified resignation as she stares down a slow drowning. Utterly believable and very moving. One reader, Dan, commented. Enjoyed the post about “The Last Voyage,” which I first saw as a teenager on NBC’s “Saturday Night at the Movies” in about 1965. The boiler explosion which precipitated Ms. Malone’s crisis was a fantastic pre-CGI piece of work. Really fun to watch in slow motion with our DVR options. Keep up the good work, talking about some of these lesser known but wonderful movies. Adds Graham: You just have to give Andrew and his editor wife Virginia Stone a lot of credit for even attempting to make a disaster movie on a real sinking ship, let alone pulling it off so superbly, and all on a very tight budget. Remember, this was before the camera mobility of the steadicam, of small remote camera cranes and compact LED lights. Veteran cameraman Hal Mohr, was one of only six cinematographers to ever have a star on HOLLYWOOD’s “Walk of Fame,” and with work like this you can see why. But of course it’s also the skill of the special effects team headed by Augie Lohman. The Ile De France ship itself had quite a dramatic history before it’s role in this film… It was the first ship to come to the rescue of the Andrea Doria in 1956. RING OF FIRE with a pre-Fugitive David Janssen as a cop caught up in a massive Oregon forest fire. One of the best fire pictures for sure, and no CGI. Andrew Stone was also good in crime pictures, as with CRY TERROR with Rod Steiger, THE STEEL TRAP with Joseph Cotten. Before THE LAST VOYAGE, Stone brought crime onto another ship in THE DECKS RAN RED starring James Mason and Broderick Crawford. I’ve yet to see the so-called film scholars and historians pay any attention to the likes of writer-producer, director Andrew Stone. As like so many other “B” movie-makers who’s films were often better than the big budgeted “A” pictures they accompanied, were simply taken for granted and ignored.